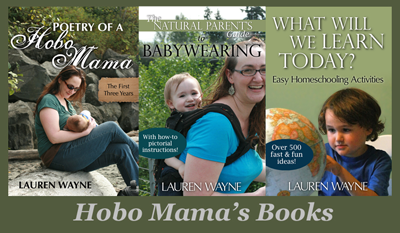 Hobo Mama: Hear me speak on long-term breastfeeding today! Hear me speak on long-term breastfeeding today! Please head over to the Healthy Child Summit today to hear me talk about breastfeeding beyond infancy and tandem nursing! The Healthy Child Summit is FREE and is in sneak-peek mode right now, and my interview was selected for inclusion in this preview. The full summit will be available in February, but for now you can hear me speak today only! Hop over with my affiliate link to register and listen for free! The Healthy Child Summit is an online resource where parents can be educated, inspired, and empowered to care for their family naturally. It provides concise, easily digestible information on a wide range of topics from pre-conception all the way through the teen years. All you need to do is register with your email address, and you'll be signed up for notifications on and access to all the presentations, including MINE today. Woo! There's also a giveaway a week through December 20! Enter to win fabulous packages of healthy and eco-friendly prizes from sponsors like Naturepedic, Rocky Mountain Oils, and Tropical Traditions. The full summit will be available in February. Go enjoy the preview presentations available now for FREE! I was very happy to have a telephone conversation about one of my favorite subjects: breastfeeding! I was even happier to shed some light on the more culturally unique subtopics of long-term breastfeeding (also called extended breastfeeding, full-term breastfeeding, or breastfeeding past infancy) and tandem breastfeeding (nursing more than one child at a time, though not necessarily simultaneously). 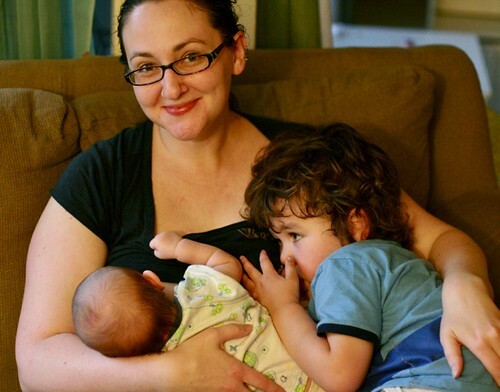 I discuss five years of breastfeeding Mikko, including his gentle weaning, and two and a half years (so far) of breastfeeding Alrik. I talk very honestly about my own experiences, challenging as they were, with breastfeeding through pregnancy and tandeming. I give pragmatic advice about how to encourage a mutually respectful and beneficial breastfeeding relationship with toddlers on up. I'm able to point to some of the research and resources available about the effects and benefits of long-term breastfeeding. So join me over at the Healthy Child Summit today — I look forward to hearing what you think! Disclosure: Healthy Child Summit links are affiliate links. I try to seek out only products I think you would find relevant and useful to your life as a natural parent. If I don't like a product, I won't be recommending it to you. See my full disclosure policy here. Wordless Wednesday: Merry Christmas to all! Put your boots out: It's Nikolaustag!